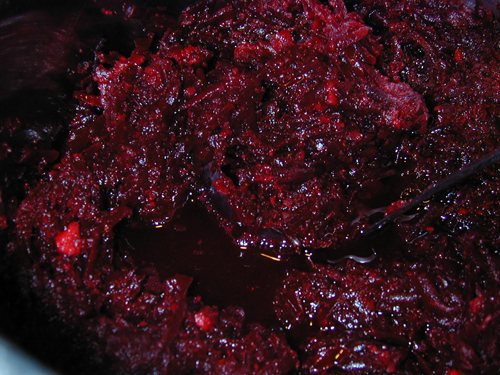 Borscht is a Russian and Jewish beet soup that can be made with or without meat, served hot or cold. The cold versions are often served with sour cream (unless it’s a Jewish recipe and it has meat). There are many variations. The addition of ginger and carrots is my own invention, though I doubt it’s unique. My borscht is vegetarian, served cold, with sour cream for those who want it. Although you can serve borscht year-round, I almost always make it for Passover. This year was no exception. To me, beets are a necessary part of the holiday and, if I don’t make borscht, I will make another dish featuring beets. Makes about a gallon of borscht, which is enough for 2 dozen bowls, plus some leftovers. Feel free to scale the recipe up or down to meet your needs. Note that this is a raw recipe, aside from the beets. One day, I’d like to try it 100% raw, but I need to find a way to soften the beets. Wash the beets well, cut off greens if any, and place in to a soup pot where they are covered with water (use filtered, not tap). Simmer until fork tender (a fork goes in but not with great ease), about an hour. 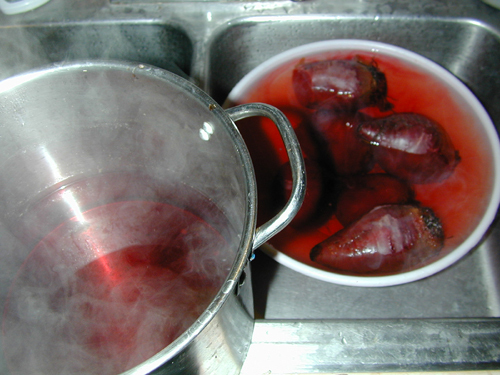 Remove beets from liquid and soak in cold water to cool (or cool slower with no water). Don’t discard the cooking liquid. Once cool enough to handle, the skins and tops of the beets will slip off in your hands. Compost the skins and put the beets back into cool water if they are still hot. 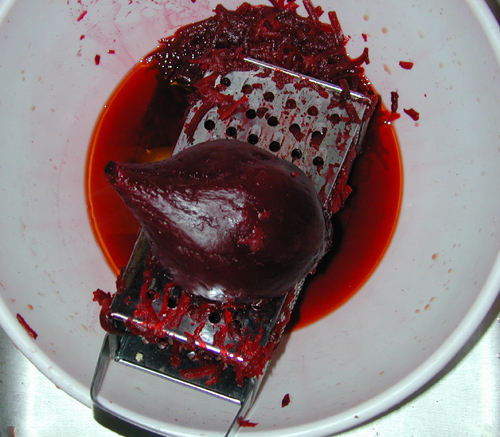 Using a large-holed grater, grate the beets into another container. They can be completely cooked through or slightly raw in the middle, as per your preference. I like them more on the raw side. The liquid in this bowl is leftover from the pot (which I emptied for the carrots and celery). I removed two quarts of broth (one went back into the soup later and one got frozen). 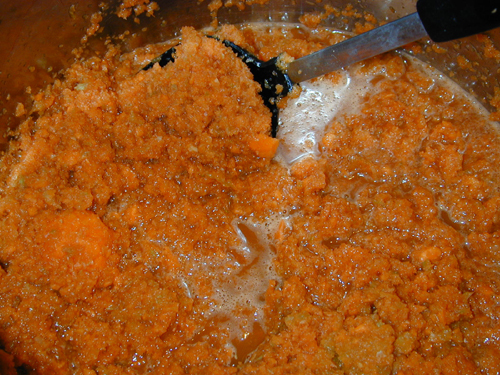 Food process the ginger with the carrots and celery and put back into the empty pot. Add the grated beets, season as desired, then add as much broth as you wish to get the right consistency. I like this soup thick, almost like a stew, so I only added back one quart. At this point, you can add the lemon juice. I generally do not because one of our regular Passover guests is allergic to citrus. I serve lemon wedges on the side and strongly encourage people to add the juice from a full wedge (1/6 of a lemon) to each bowl. Good as is or with a dollop of sour cream.